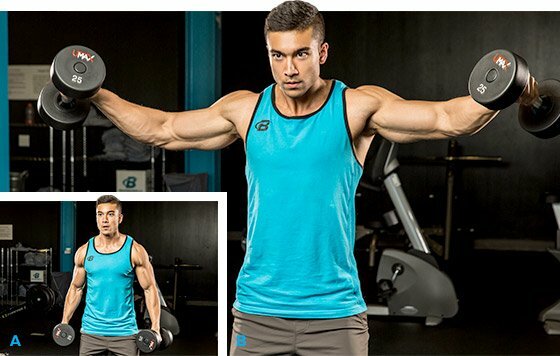 Finish your shoulder routine with this giant set that will ignite your delts, deliver a monster pump, and send your muscle growth into high gear. There are two kinds of lifters: those who cannot miss a workout—even if a category 4 hurricane is approaching—and those who spend more days "recovering" than actually training. At one point in my life, I hated skipping workouts, and that included while on vacation. I spent a lot of time searching for gyms, oftentimes hunting them down on street maps in foreign languages. Looking back, it might not have been the best use of my vacation time, but it did expose me to new training concepts. And so I recount here a trip to Rio de Janeiro—not the details of excursions to the sandy beaches of Ipanema or the Christ the Redeemer statue, but the excruciating pain of a finishing move I did on one particular shoulder day. Talk about a monster pump! Once upon a time in Brazil, I was navigating my way through a small, crowded gym without air conditioning in the middle of summer when a personal trainer introduced himself, which gave me a chance to use my mix of Spanish and Portuguese called "Portunol." He was selling his personal-training services, for which he charged a whopping $35 for an entire month. I know a good offer when I see one, so we struck a deal. It was shoulder day, so he suggested the usual assortment of presses and straight-arm raises—nothing I hadn't done before in my Los Angeles gym. But it's the finishing movement that I remember—a souvenir of sorts I carried with me for a few days, courtesy of something called delayed-onset muscle soreness (DOMS). It's what every bodybuilder trains for—except for when it's really, really bad. He had me finish that day's shoulder session with a giant set using a pair of 12.5-kg dumbbells. By the time I'd computed that weight in pounds (nearly 28), it was too late—I'd already committed. 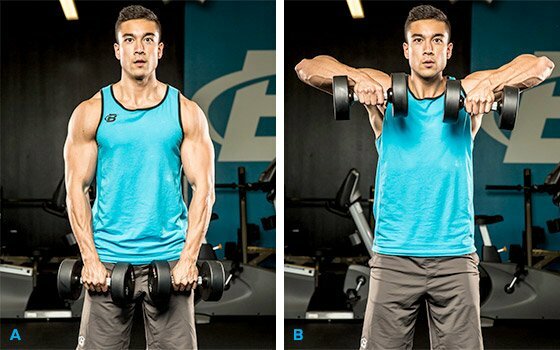 Choose a pair of dumbbells that's about 10 pounds less than what you normally do for a 10-rep max set of standing lateral raises. Your first exercise is exactly that movement. Even though you're fatigued at the end of your workout, with the lighter weight you should be able to bang out 10 good reps. With lateral raises, it's important to raise your elbows up high because that motion best targets the middle delts. 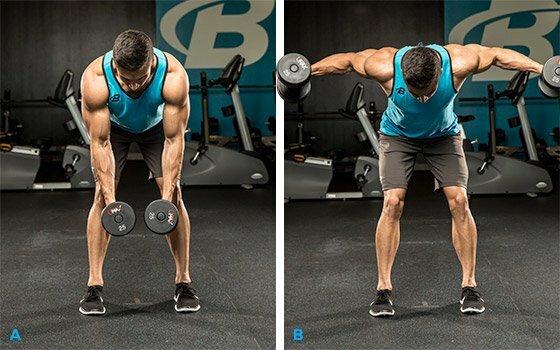 Without changing weight, go right into bent-over lateral raises. Simply bend over, keeping a flat back, and maintain your head in neutral alignment—don't strain your cervical spine by looking up. 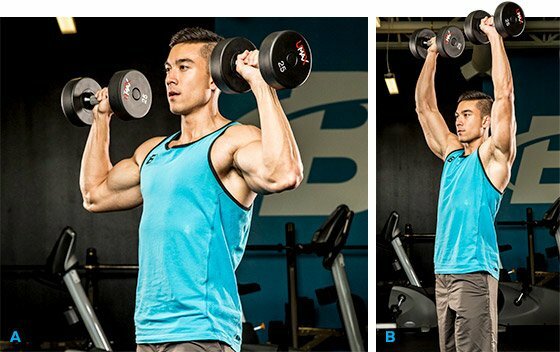 Do another set of 10 reps, bringing your hands out wide and as high as you can. Next, stand up and do a set of dumbbell upright rows. Even though fatigue is starting to set in, this is a multijoint movement that recruits all three deltoid heads, as well as the upper traps. Keep the weights in tight to your body as you push your elbows out to your sides in the top position. Do another set of 10 reps.
Go right into a set of 10 overhead presses. Yes, this is a ridiculously light weight you're pressing, but when preceded by three other exercises it significantly increases the challenge. Use a split stance for better balance, completing the presses by bringing the weights close to each other at the top without allowing them to touch. Take a 90-second rest and complete two more rounds. On your last round, when you drop the weights after you complete your set of overhead presses, raise your arms all the way overhead for a full 60 seconds, and watch the clock. I guarantee your arms will feel like lead weights at about 30 seconds and you'll want to cut them off—that's how intense the burn will be. Once you make it to 60 seconds, you're done, but I suggest you prop your arms on something, because even the act of holding them by your sides will hurt for the next few minutes. 90 sec rest between rounds. On your last round, when you drop the weights after you complete your set of overhead presses, raise your arms all the way overhead for a full 60 seconds. Try this finisher for a monster pump on your next shoulder day and let me know how it goes in the comments below! Stately shoulders are the key to any well-rounded physique. Build sculpted shoulders with this workout from IFBB bikini pro Brittany Tacy. UFC fighter Chris Weidman wins matches because he out-works everyone. Here's the hard-core training protocol that helped him defeat Anderson Silva. Ready for your most intense triceps pump ever? It takes 10 minutes and a one exercise—seriously!